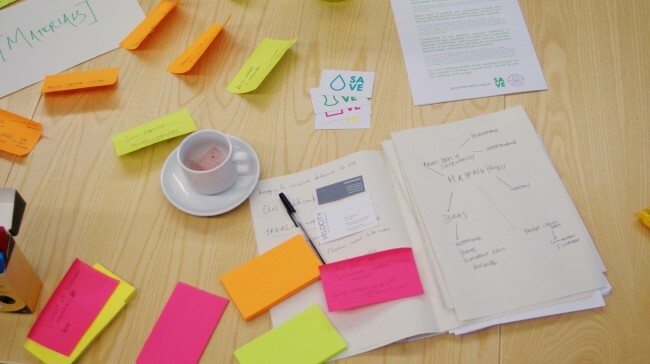 CCS Project Officer, Gemma Lawrence, reflects on our most recent Green Tease, hosted at Glasgow School of Art, which explored questions of environmental sustainability in artistic practice. Last Tuesday we gathered for another of our monthly Glasgow Green Tease which bring together folk interested in arts and sustainability to hear about how environmental sustainability is being explored in practices and projects across the city. Hosted in the new Reid Building, we were led by Eilidh and Kathy from Glasgow School of Art’s Artists Using Resources in the Community project (ARC for short) to think about various questions concerning sustainability within artistic practice with a slant towards visual art. In spite of the busy time in Glasgow we were joined by a good few people including artists Rachel Duckhouse, Ellie Harrison and Penny Anderson; Ben Spencer producer of Velocity, Heather Claridge from Land and Environmental Services at Glasgow City Council; Chris Fremantle of eco/art/scotland and David Parr from Sustainable Glasgow Project. Starting with some very practical themes of energy efficiency in artist studios, understanding the carbon cost of materials and material re-use, Eilidh and Kathy were keen to hear from the group how best they could support artists towards greater environmental sustainability in these areas. The conversation quickly grew legs and took a broader view of how we talk about sustainability in artistic practice with some key ideas emerging from the discussion. Here’s a quick summary! We questioned whether we need to find different ways of talking about institutional v.s. individual responsibilities towards sustainability. We discussed the ‘tenant-landlord problem’ which artists often face when working in studio/office spaces within bigger buildings managed by someone else. In such situations the individual can feel a lack of responsibility or connection towards the way in which their office is heated or how their waste is dealt with. Penny Anderson referred to this as the tragedy of the commons where users of an unmonitored common resource all have an incentive to over-exploit it, even if this leads to the resource being degraded or destroyed. But it can work the other way where artists want to have greater awareness, control and say over the resource use in their working spaces and some new connections were made at the meeting which might go some way towards this. As Chris Fremantle pointed out, for artists the stories they tell and more important than the rules they abide to and I’d be in favour of embracing a diversity of artistic approaches to sustainability whether in process, form or content of the work rather than a one size fits all approach. We also engaged with the different stages of making and exhibiting an artwork including the sourcing of materials, the processes of making, the showing of work and its conservation if it is bought by a collector. Chris pointed out that Graham Fagan’s bronze Christmas tree which is currently exhibited on the ground floor of the Reid Building could be considered highly sustainable, given its long life span, the lack of work that would go into its conservation and the potential recycle-ability of the material used. 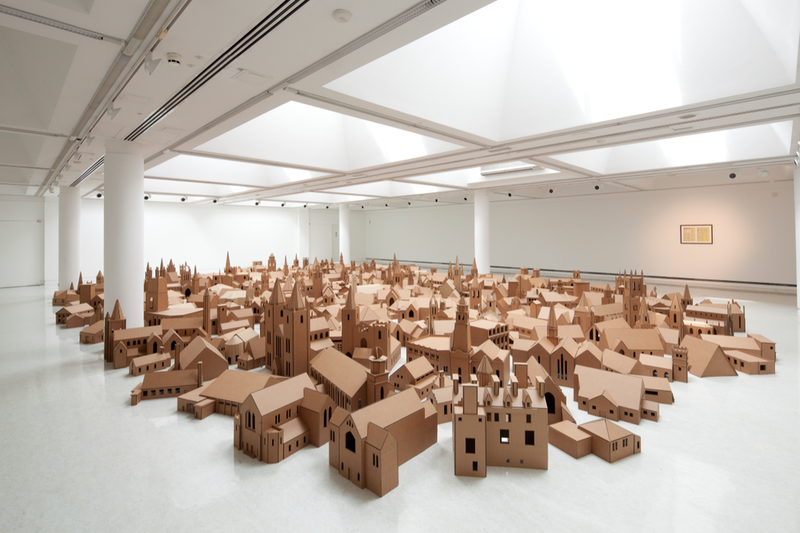 By contrast, Rachel Duckhouse mentioned Nathan Colley’s The Lamp of Sacrifice, 286 Places of Worship, which was originally made as a temporary work before being bought by the Scottish National Gallery of Modern Art as part of their permanent collection. She questioned what it meant to have a work transition from an impermanent to permanent state and how this affects it’s meaning but also the unanticipated efforts that go into conserving it – in this circumstance, the preservation of 286 cardboard models. However we might think about sustainability in artistic practice, it is clear there’s no single way of engaging with the ideas and questions it throws up. Chris mentioned the mining of Scottish identity which many Scottish artists have been engaged in over the past 20 – 30 years and which has likely played some role in bringing us to where we are today with the referendum approaching in just over a month’s time. This is maybe a useful way to also think about artists’ roles in relation to environmental sustainability – that it is a consistent questioning and curiosity from many perspectives and voices over a long period of time that will lead us to wider societal shifts. Hopefully Green Tease can make its contribution to this in providing people with the space and time to continue questioning what sustainability means to them. Thanks to all who came along and we look forward to seeing you at our next get together. be sure to check our News page, Facebook and Twitter for up-to-date information and our Instagram for more event photos. Feel free to post your own Green Tease reflections using #GreenTease.